It was 25 years ago today that the Challenger shuttle mission carrying Christa McAuliffe, the 'teacher in space' and six other astronauts, lifted off from the Cape. Only 73 seconds in, the shuttle exploded in a fireball, killing all seven astronauts aboard. (see information about the mission and crew, including a video tribute at the NASA web site ) I was always interested in astronomy and space exploration, I remember watching with excitement as Armstrong stepped on the moon, experiencing the Apollo 13 incident with the world and other discoveries and missions. 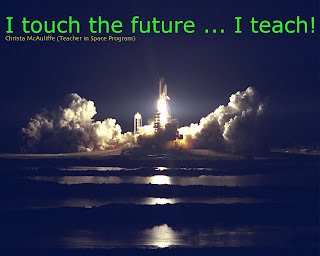 In 1986, I had been a teacher for almost 8 years and the space program still held my interest. I remember that fateful day, I was excited about this mission and Christa was a hero, imagine a teacher actually going into space! In the school I taught at, we had a television hooked into cable, in the staff room in the far corner of the school, I was able to get to the staff room and watch. It was one of those moments that sticks out in time - like 9/11, like JFK's assassination ... I remember the shock, even a tear as I watched the incident unfold before me. I did not know these people, loss of life is always tragic, the loss of all these brave men and women was a deep loss, but Christa was one of us, a teacher. The quote in the image I put together above is one of my favorite quotes about teaching, it is my tribute to the Challenger crew and Christa McAuliffe - she continues to 'touch the future'.